In other publications (here and here for example) I've been trying to model and map the different types of existing and emerging journalisms - both online and offline. As I expand my research agenda, I aim to map media work in general (and new media praxis in particular) onto a new version of the same model, as I find a 2-dimensional (and if I include a historical trajectory, 3-dimensional) modeling helpful in organizing the sometimes bewildering variety of developments, trends and studies out there. The model as presented here is a first attempt to include ALL media phenomenona I've been discussing here: interactive advertising, citizen journalism, upstream marketing, open source media work (for example game development using gamer modifications), and so on... But it also leaves room for all the 'traditional' stuff out there: downsteam, top-down, "telling you what you need to know" and "show-and-tell" types of media work. Its work in progress, so please add your comments! 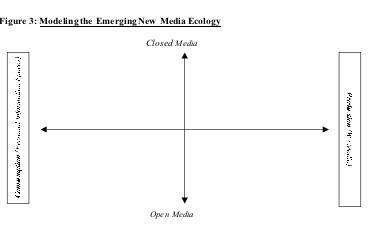 In case the picture isn't readable: the horizontal axis represents the continuum from media consumption (individually, in terms of our so-called 'Personal Information Space') to media production (collectively, as in 'We Media'), assuming that our media use ALWAYS is a combination of production and consumption. The vertical axis shows the continuum between closed and open media, indicating the level to which professional (and 'amateur') media makers allow unfiltered, unmoderated, unabridged, uncopyrighted, and unedited use. IMHO this is one of the first models that effectively breaks down the barriers between media production and consumption, considers 'content' as both media infrastructure and media products, and sees media use as the exchange of activities between people as well as allows for one person to occupy multiple spaces within the model.